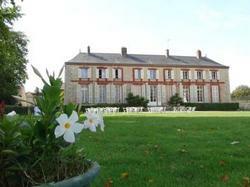 Located 35 km from the south of Paris, this B&B features 2 tennis courts and a horse riding school. It also has a lounge seating area with a billiard table and bookshelves. Furnished in a modern style, rooms have a private bathroom and are provided with free internet access and flat-screen TV. They all have a view on the estate?s park. After breakfast, guests at Le Domaine d'Euclide can schedule horse rides or relax in the B&B?s seating area that includes a TV. Arpajon RER Station is only a 10-minute drive and gives direct access to Paris. Fontainebleau is 59 km away. This room offers a view of the park. It includes a flat-screen TV and free WiFi access. With a view on the park, this spacious room has private bathroom, flat-screen TV and free WiFi access. With a view on the park, this room has private bathroom, flat-screen TV and free WiFi access.